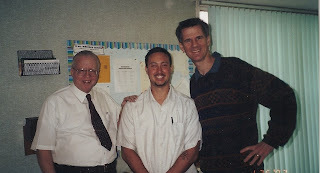 It is with heavy sorrow, and yet at the same time extreme joy, that I declare to you the passing on into eternity of one of the Greats in Christian instruction and example, Professor Zane Clark Hodges. I believed in Christ for eternal life in 1993, and within a year I had a copy of Absolutely Free! in my hands. This book set the course for my theological instruction and practice. Over the years other books authored by Zane Hodges found their way onto my bookshelves and into my heart. When I finally got the internet about 10 years ago, I found a website for his publishing company, Redencion Viva, and secured his email address. Over the last 10 years we have corresponded. He has always been available to answer my deepest questions about the Bible. 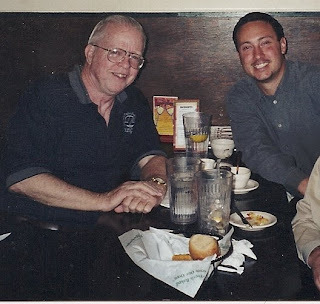 In 2003, I finally met Zane Hodges in Texas, and shared the Lord's Supper on a Sunday morning at Victor Street Bible Chapel with him and had the privilege to take him out to dinner that night. Since that time we have shared many profitable conversations on the phone and more correspondence via the internet. In March of this year I was able to once again meet him face to face at the Grace Evangelical Society's National Conference. 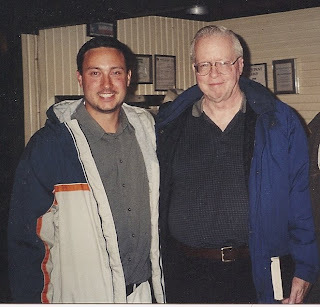 For another time, I had the privilege to take him out to dinner and discuss the Bible and theology. Zane Hodges and his ministry has changed my life. He was always a very patient man with me. I remember one conversation I had with him on the phone lasting over an hour talking about the doctrine of election. I don't know of any other person in the ministry who has had as great of accomplishments as Zane and yet who is so down to earth and willing to take time out to converse with the little guys like me. 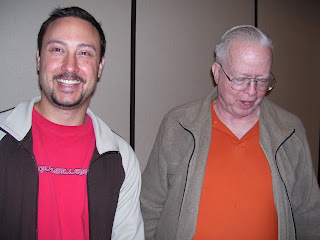 It was Zane Hodges who taught me biblical synthesis. His views and positions on the Bible allow for all the parts to be taken at their face value without having to be mired down with the ad hoc inclusions of secondary assumptions. His take on the Bible rises above each fact, explaining them in such a way, in their context, as to mesh with and compliment each other. His commentaries on James, 1 John, and Hebrews are second to none, explaining them so deeply, yet so simply. I love listening to his sermons. He always gave them unique names and used the most interesting illustrations. He was a very well read man, and kept up on current events. When I received the news about his passing today I was shocked and deeply saddened. I have fallen in love with this man and he has the dearest of places in my heart. He will be deeply missed! The Church has lost one of its Greats! But the Lord has welcomed him, no doubt, with a "Well done, good and faithful servant. Enter into the joy of your Lord!" "Oh Heavenly Father and the Lord Jesus Christ, thank you so much for the wisdom and insight into Your Word that you have given to Zane Hodges! Thank you that You have used him in the capacity that You have, and this for Your glory. You have blessed me and countless others through this humble servant of Yours. My walk with You has been enriched and edified by his ministry. Oh Lord! I await the day that the Lord Jesus Christ comes back, so that I may sit at His table, eating and drinking with Him. Oh Lord Jesus may my life and ministry be half of what Zane's is. Father, continue to use Zane Hodges' materials and teachings to your glory!" Please pray for me as I will be hosting 2 - 4 LDS missionaries to my house tomorrow. I work at a church as a part time deal, and as I was getting ready to leave one Saturday, I saw 2 LDS missionaries proceeding to a house across the street from the church. They waved and nodded to me. I nodded and smiled. Now I don't know if they were uncomfortable with visiting a house to proseltyze it so close to a Southern Baptist church or they were arrogant with spiritual pride, or just plain friendly. Hello, my name is Antonio da Rosa. If there is ever a time that you want to have your faith challenged by the Bible, I would be most interested in meeting with you. I didn't hear anything for about a month and a half, but I received a phone call about a week ago and now I have a meeting with them. Please pray for me as I wish to be used as an instrument and tool in God's hands. Pray for wisdom and a moving of the Holy Spirit. Pray that God would orchestrate and oversee the conversation and that I can be sensitive to His leading. Pray for the salvation of these men who have become entangled in a hopeless religion.